Producer of roto-gravure printing presses acquired by Baker Perkins in 1961. The West Bromwich factory was closed in 1976 and production moved to Baker Perkins Ltd. Westwood Works, Peterborough. James Halley, a Glasgow engineer, settled in West Bromwich at the turn of the century as a maintenance engineer to a local firm of printers. He was a more than competent craftsman, capable of making almost anything by hand. More than this, he was an inventor and a designer of no mean ability. 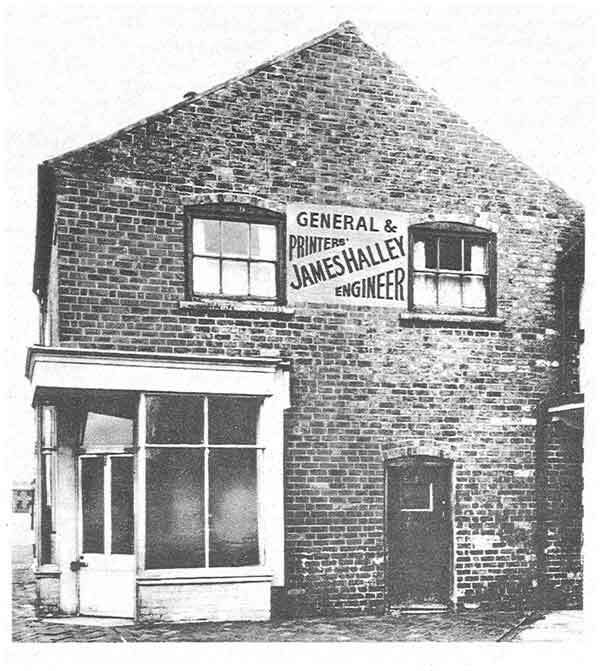 James Halley's first premises in 1912. In 1910 he started a small engineering business on his own. By 1912 he had designed and was building his first rotary press, a letterpress counter chequebook machine for another local firm. By 1914 he had built three or four of these machines. Despite, like some of the Bakers at Willesden, having doubts about the righteousness of waging war, he was pressed into Government service, making shell-fuses until the Armistice. This not-unprofitable activity enabled him to buy a small plot of land and build a factory where, in 1919, he designed and built the first walk-in type of rotary web-fed printing press. This lead has since been followed by all rotary press makers. The workshop plant at this time was second hand junk collected from local scrapyards. The quality of work produced on this machinery was a testimony to the skill of this thrifty Scotsman. In the early 1920's, James Halley was joined by his two sons, Jack and Angus, together with Mr. Reg Charlton and Mr. Charles Baker. By 1937, Angus Halley had taken over most of the design work from his father and the first roto-gravure aniline machine was designed and built. This machine was still running over 30 years later at Harrisons of High Wycombe. Halley purchased some 26,000 square feet of land in 1938 which came in very handy when the firm had top turn over its production to war work in WW2. Many of Halley's skilled men had enlisted and woman were brought in to help turn out component parts for Bofors and Sten guns, land and sea mines, tanks and torpedoes. A new building erected on the recently purchased land provided much needed manufacturing and office space as, before this extension, operations had been confined to the plot acquired twenty-five years before. After the war, it became obvious to Angus Halley that the wrapping and packaging of goods would increase dramatically in the post-war period and he began to concentrate on the production of presses for printing packaging materials. (It should be noted here that the Baker Perkins group also had a long association with the packaging industry, accumulating a very broad capability across a wide range of packaging applications. (See also History of Baker Perkins in the Packaging Industry). Such was Halley's success that by 1948 he entered the overseas market. Expansion was now imperative and adjoining houses were bought as offices with factory premises being erected in the gardens to the point that they were hemmed in on three sides, unable to expand further. It was not until 1967 that the £70,000 acquisition of 60,000 square feet of land and factory adjoining their existing premises provided a doubling of production space, quickly followed by an increase of 150 in their labour force. The output of the company was mainly web-fed rotary presses though ancillary equipment was produced frequently to satisfy customers and ensure repeat orders for further rotary presses. 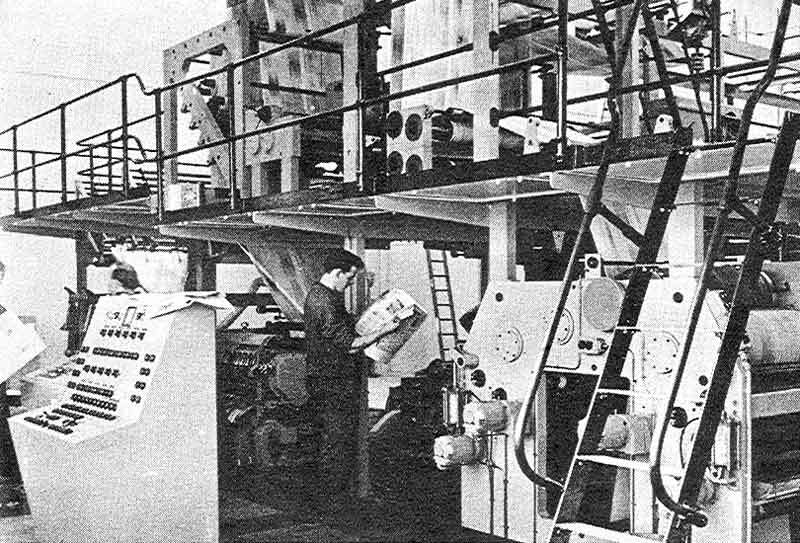 The business first produced rotary presses for letterpress printing, then for aniline (flexo) printing, from there on to rotogravure printing and, by the middle 60's much of the production was in web-offset; this last being of particular importance as it was possible to utilise a useful percentage of the production capacity available at the Baker Perkins facility at Westwood Works. 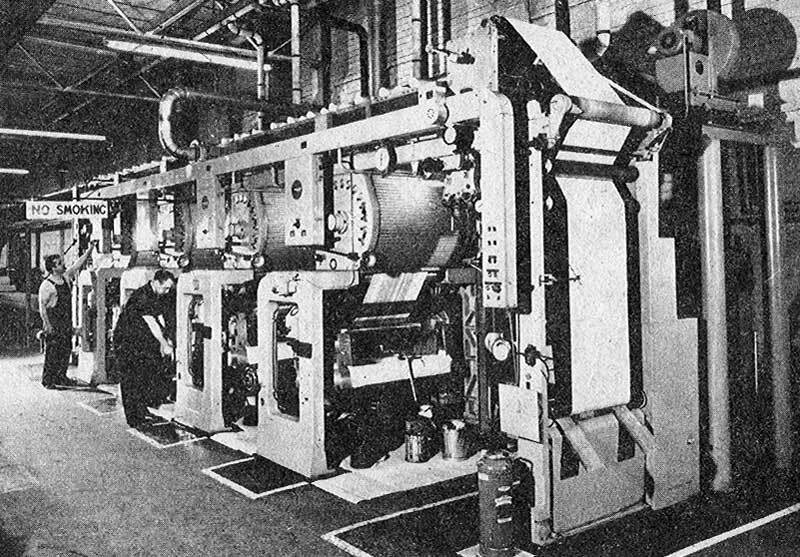 It is worthy of note that the Baker Perkins Group Newspaper "Group News" was printed on a Halley web-fed offset litho press, built at Westwood Works and installed at the East Midland Allied Press factory at Woodston, Peterborough. This was the first Halley machine of its type installed in the UK. (See also Group Newspapers). Halley "Group News" press at East Midlands Litho Printers. Halley were always in the forefront of the application of the latest technology to its products A mutually advantage relationship was built from around 1955 with Crosfield Electronics, a world leader in the development of electronic controls for printing with Halley being among the first to recognise the importance of Crosfield innovations. The Crosfield synchroscope removed the speed limitation imposed by the fact that a press could run only as fast as the operator's eye could check the printed web as it moved through the machine - and that was not very fast. The synchroscope produced a stationary image of the moving web, allowing the printer to check every detail on a web moving far faster than the eye can follow. Other Crosfield products used regularly on Halley presses were automatic controls for colour register and for electronic ink viscosity. Not all innovations were connected with electronic controls, one limitation to making a press run faster being the need to dry the material being printed - another Halley research exercise resulted in the development of one of the world's finest drying systems. In addition to exploiting their connections with the printing of packaging materials - cardboard, aluminium foil, polyethylene and other very thin films, in the 1950's, Halleys went into the so-called 'Fashion' field of plastic floor coverings, flexible plastics used for curtains, table cloths clothing and wallpapers, 'Formica' and similar products. This venture followed from the successful adaptation of a Halley rotogravure press to print wallpaper for Sandersons. These new techniques in printing led to the development of wider and wider printing machines, with constantly improving performance. The vigorous attack on overseas markets started soon after WW2 continued when the firm entered the Baker Perkins Group early in 1961. 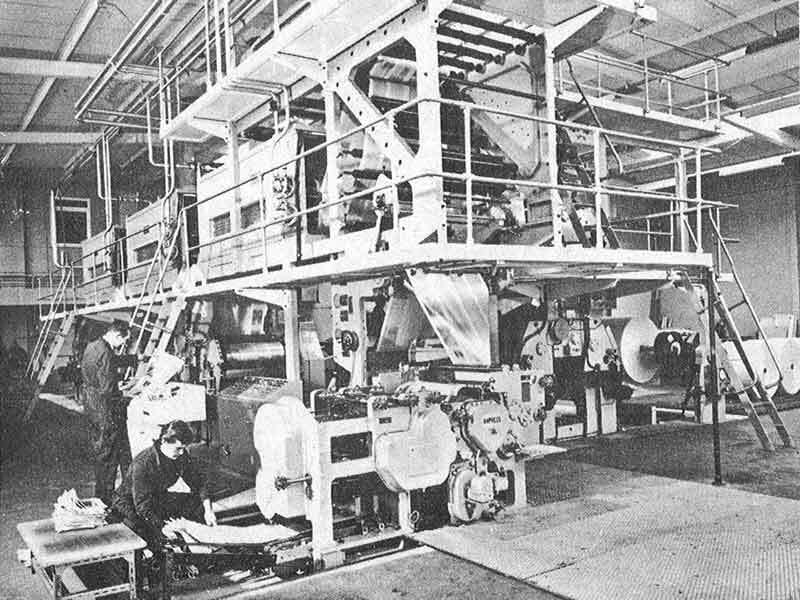 Halley announced in May 1967 a plan to double the factory space at West Bromwich to meet the growth in demand for gravure printing presses. 60,000 square feet of land and adjoining factory space was purchased for £70,000. It was expected that the Halley workforce would increase by some 150 people. The work was completed in early 1968 and included a demonstration and development bay in which work was progressing on a press for handling PVC and a gravure press capable of handling a variety of materials used in the flexible packaging field, at speeds up to 1,000 feet per minute. The last member of the Halley family still connected with James Halley & Sons Ltd., Mr Angus M. Halley, retired at the end of 1967. Angus Halley had joined his father, James Halley, in the business in 1918. E.E. Miller, who had joined Halley from Peterborough as deputy managing director in the summer of 1966 was appointed chairman and managing director. After two years of exhaustive investigations by Baker Perkins Holdings, it was decided that with effect from 1st April 1975 James Halley & Sons would become the responsibility of Baker Perkins Ltd with L.P. Simpson, deputy managing director, taking the position of chairman of James Halley. The marketing, sales and technical functions were rationalised and integrated with those of Baker Perkins' Printing Machinery Division, with some James Halley employees being offered jobs at Peterborough. Manufacture continued at West Bromwich until December 1975 when the factory was closed with the loss of about 100 jobs.